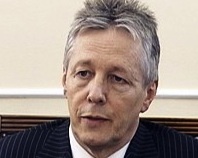 We’re told the police haven’t interviewed Peter Robinson yet about his wife’s financial dealings, though in the course of their investigations they surely will have to. Castlereagh council’s own inquiry grinds on. Who knows when the swirl of accusation, rumour and innuendo surrounding the Robinsons will be resolved? It forms a dark cloud over Peter Robinson’s future. The fact is that his political career is fatally wounded. As a political figure Robinson has been terminally weakened. Not only politically but physically he has visibly shrunk. It’s clear that the pressures of the last six months have been preying on his mind, as they would on anybody’s. One result is a welcome period of silence from him particularly since losing his Westminster seat after 31 years. Ifs now not a matter of whether his career is over but when. During the spring the British government in the shape of the previous transient proconsul ignored all attacks on Robinson, even laughably endorsing Robinson’s claim that he had nothing to answer, something the electorate of East Belfast took a different view on. The reason for the proconsul’s support was plain. The British government needed Robinson to push through the devolution of policing and justice. It has been remarked elsewhere that just as there was a ‘Save Dave’ campaign in the early years of this decade, so early this year the NIO mounted a ‘Keep Pete’ campaign. That effort is no longer in operation. Robinson has served his purpose. The new British government doesn’t need him for anything so his fate lies in the hands of his own party. Over the years he has made enough enemies there to make him walk the plank before long and much rejoicing there will be at the sound of the splash. In the past Robinson’s organisational abilities at elections were too valuable to lose. No longer. He couldn’t even keep his own seat. The only question for our members now is how much of a liability will Robinson be in next year’s assembly elections. Already in the Westminster elections some candidates had decided it was better not to have Robinson’s picture on their election material. In the meantime, the whole imbroglio is having a seriously detrimental effect on the workings of the assembly. Robinson’s precarious position within his own party has produced paralysis at the Stormont executive despite the high hopes at the time of the deal on policing and justice. OUP ministers like the hopeless Poots now go on solo runs with impunity. Robinson’s political weakness renders him impotent. The pressures and uncertainty have turned Robinson into a zombie first minister. Eventually everything ends up in the Office of First and Deputy First Minister where Martin McGuinness’s agreement is required and of course he won’t agree to proposals driven by obvious DUP party advantage like blocking housing in north Belfast in case the new residents vote Gerry Kelly in as MP. Or interfering with the independent Boundary Commission’s recommendations for new council districts. Or blocking education reform whether on selection or administration. Vetoing DUP proposals is all McGuinness can do, however. The outcome is stalemate because Robinson no longer has the clout in his own party to impose his will. Every single important issue facing the executive has now simply been pushed further down the pipe. To a large extent this blockage will be masked by the summer recess but come the new session in the autumn when major decisions will have to be taken, not least about the October spending review, the reality that Robinson is first minister in name only will be revealed for all to see. Dress it up as you will there is only one of two options. Either Robinson will have the wit to see he is a lame duck first minister whose political career is over and resign, or the DUP will decide that Robinson has become the story and no-one is listening to anything the DUP says about politics and they ditch him. Either way Robinson’s days are numbered. Great, you might say, that leaves both unionist parties in turmoil. Be careful what you wish for. Survey the parade of space cadets behind Robinson. Who would you pick?